These Are In The Ruby Crystal Rim And Barely Noticeable Unless One Knows Of Their Existence. MODERN LUCITE OPEN HANDLED SERVING TRAY WITH 6 HI-BALL TUMBLERS. YELLOW BUTTERFLY. 16" LONG BY APPROX. A GREAT ADDITION TO A MODERN COLLECTION. IN EXCELLENT CLEAN CONDITION - LIKE NEW. Bar/Cocktail Glasses. They are apparently "shooter" glasses. on one side with a clock. These glasses have a Stop Watch Motif. The other side also has a Stop Watch Motif. have a Gold Pocket Watch Motif. It has one chip as photographed. An excellent collectible! Make Supersized Seem Small. Get Images that. - If we are notified within 48 hours of receiving the item. 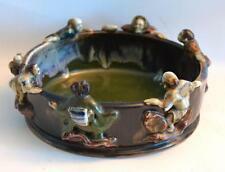 Crab or Crayfish Ashtray. form of a detailed made crab or crayfish. I don't know whether it was. originally supposed to be an ashtray. After a good cleaning it could also. 1920 ART DECO 1940. manufactured during the era of Art Deco. CORDIAL SET. The set consists of a sphere shaped decanter with a clear glass stopper and 4 glasses. There are a few isolated air bubbles. No maker's marks were observed. Don't miss out! 4.25" Tall by 3.25" across the mouth and holdappx. So I can't say for sure but they are in that style and research. would make a great addition to your MCM stuff. There may be more of that, I don't see anything but its fairly invisible on the pieces. 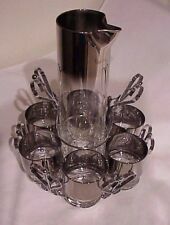 This is a sleek Mid Century bar set designed by Carl Aubock that includes 11 glasses, a pitcher and stirrer. The glass stems are wrapped with rattan, as is the handle of the pitcher and the top tip of the stirrer. Complete kit. Holds 2 bottles. Clean and ready for use. This is an iconic set of glassware which features pink elephants frolicking and accented with stars. There is one tall glass that is slightly frosted and faded. Condition is Used. 4 shot glasses. There is wear and tear on the front and the back of the bar. I am easy to work with, I will make things right. Any errors are purely unintentional, honest mistakes. The case has 4 Baccarat Decanters - 1 with full label, 1 with 1/2 label and the other two have no labels. No major chipping to stoppers. There are 12 glasses total with 4 missing. Six of the glasses have very minor fleabites at the bottom of the square corners - nothing major. Featured here is a unique set of a pewter bottle opener and corkscrew from Snorre of Norway. In its original box and crafted by artisan Sigmund Espeland. The pewter is heavy and free of additives, making them safe for use with drink. Classic Executair 707 travel bar. This one lacks a key so be sure to put it out of reach of the kids when you've got booze bottles in the three bottle wells. Adorable for bar display or practical use! Outside brown Leather is near excellent. Inside has wear as shown. Closes securely - do NOT have the key, but not necessary to open case. This wonderful cocktail set looks very modernistic with its streamlined design and art deco style. It has a great deco look - very modernistic and unique. Pictures don't do it justice. The shot glasses say "just a thimble full" on the bottom. There is a small lock on the bottle cage and no key. Looks like a luggage lock, should be easy to remove and replace. The wheels will move if you manually turn them and they turn barely at that. They need cleaned or replaced. Condition is LIKE NEW. Super super nice. Still has silica in the case, the combination has never been set and the instructions to do that are in the case. It holds two bottles of booze. 10 LOW BALL, ROCKS, ROLY POLY COCKTAIL GLASSES. One glass ladle. LADLE: 14" LONGEST POINT. ONE PUNCH BOWL-HEAVY SET. EACHPHOTO IS WORTH A THOUSAND WORDS AND THEY ARE OF THE EXACT ITEM YOU WILL RECEIVE. Vintage 4 Piece Bar Tools Set. Condition is Used. Handles are old alcohol bottles,with dice inside. The tools are ice tongs, bottle opener, double-sided jigger and garnish knife. The set is 9-3/8" high. Green felt on bottom. Brookstone Mini Bar Portable Tabletop Bar and Accessories. Condition is New in box. Very good pre owned condition. Faux croc leather hard case is in near mint condition. Inside is lined with silky fabric. No stain inside or outside. No rip, no repairs. No pitting on bar accessories. Stunning Mid Century cocktail set. Colors are BLACK & GOLD. Each glass holds about 2 ounces (would be considered shot glasses). There is no maker mark on any of the pieces. If an item is grossly misrepresented, I will make every effort to accommodate the situation. RED ORANGE. HAS MULTI USE PURPOSE. 7 PIECE SET. EXCELLENT CONDITION SEE PHOTOS. Set Of 3 Vintage NEVCO Barware Trays Each one has a Drink Recipe and cartoon drawing light colored wood with silver colored metal corners these have removable screws and twine for hanging ”Manhattan” has some wood damage see photos please colors bright, graphics clear Bar Decor Wood Metal Shipped with USPS Priority Mail. Vintage Portable 2 Bottle Travel Bar - Hard Sided EMPTY CASE . Condition is Used. Well all the glasses stirrers openers and miscellaneous are missing from this.that isn't a huge deal you could use red Solo cups to fill this thing up for traveling and fun the biggest thing I see that is wrong there's no key for this and it does not lock securely without it. It Does stay closed but I sure would not want my friend Ron Gerlach to carrying this thing. I'm sure you know what I mean. I believe I could be careful enough but THE GERR with a couple drinks in them would almost certainly destroy your stash.that being said I'm pricing this to sell it would protect two bottles nicely under the right conditions. View all the pictures ask as many questions as you care purchase with confidence. Glass Decanter with Gold Painted Design. Hidden Bar Set in Faux Stack of Books. Distressed Leather over Wood. Varying French Book Titles. The donor of this set said it had been in her family for years, possibly since Prohibition. 3 Decanter Bar Set Bourbon Rye Scotch. Lock is Walsco- Made in USA. Entire carrying bar set is 8.5" wide and over 10" tall when locked with handle upright, 2.5" wide.